Where is the brown rice? After my disappointment in the kitchen department I decided to hit the road to get some supplies. On Sunday all the major food shops close but I know a local one, which is open on Sunday mornings. Of course, living in Paris, I pass a Boulanger, Fromager, Boucher and Patisserie, before I have even reached the bottom of my road. In my local supermarket I find the fresh fruit and vegetables (so fresh there are tiny flies checking them out too) – pretty limited supplies, but to be expected for a small shop in a quiet neighbourhood. Despite it being small, it does manage to pack in a massive freezer section, lots of wine, and aisles full of pasta, quick-cook microwave meals and so on. But nothing is wholemeal. And nothing is wholegrain. And nothing is brown – except in the cereal section, there seems to be an obsession with chocolate flavoured cereals – Where is the brown rice? He thinks I am mad. It’s raining and its a 20 minute walk, but we cross the river to the 15th and see the Eiffel Tower on the way. I had stumbled across BioCoop (there are 11 of these in Paris and hundreds more around France. Click here for the Paris locations) and I am smiling as we walk around it. It has everything from millet to fresh ginger to oat bran, to all types of tofu and miso soup. It’s not massive, but it is packed with organic goods. I buy some oat bran (son d’avoine), which I have never had before but which you can sprinkle on cereals etc and helps with the old bowels. I am certain there are more of these little gems. I just have to do a bit more searching and when I have found them I’ll go and visit them all and work out which one best suits what I want. Whatever happens on this adventure, my fiance is being a good sport. He has just signed me up to the Macrobiotic Association of Great Britain, so I’ll be checking out what that has to offer over the next few days. Not sure he knows what he is letting himself in for. I moved from a little cottage in the English countryside, with a lovely little kitchen to a tiny flat on the fifth floor of an old apartment block. As my fiance helped lug my bags up the 93 steps to our new home, he asked what made them so heavy. I wanted to say shoes or make-up, but actually it was a few of my favourite cookery books. Imagine my disappointment when I discovered my French kitchen has no oven. In fact it just has a portable hob with two rings (la table de cuisson), and a microwave oven (le four à micro ondes), which doubles as a grill / tiny oven. How can a nation, which prides itself on its cuisine have such crappy kitchens? 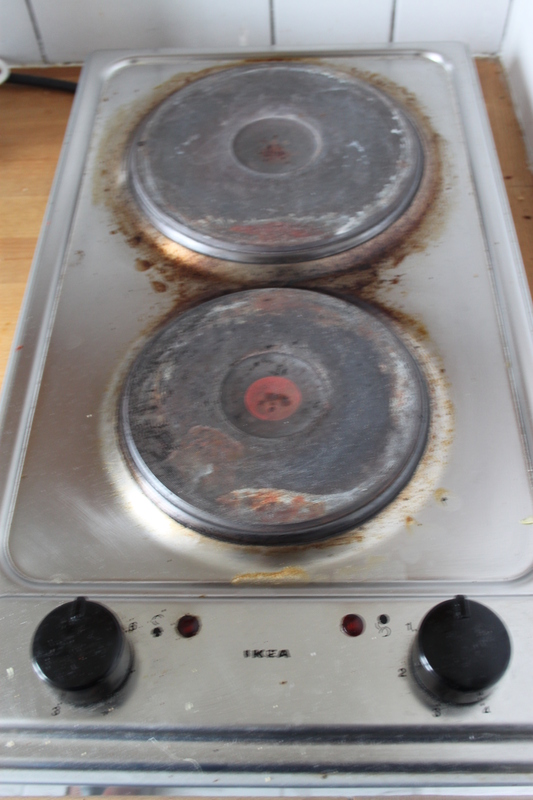 I’ve checked with a few of my new-found friends, and everyone seems to have these hobs. In fact, when one of them recently emailed saying she had found an apartment with a four-ringed hob, I had an immediate flash of envy but also hope – maybe there are places with ovens too? So this is what I have to cook on. I guess I better start searching out a slow cooker and a pressure cooker. I have to put it down as a small hurdle in my quest for the Big Life in Paris. After my first experience of macrobiotics, in February this year, at the Penninghame Foundation in Scotland, I could not wait to get home and stock up on the basic ingredients to cook some delicious macrobiotic meals. The food at Penninghame was what really caught my imagination. If this simple, healthy food could taste so good, I wanted to be able to cook it every day. We had some basic cookery lessons learning how to cook a few staple meals, such as lentil burgers, broccoli and tofu stirfy, brown rice, rice balls, miso soup and various grains and dressings, and I was desperate to continue this when I left. I found myself picking up vegetables and grains I had never heard of and had to make long lists to take with me on shopping trips because I was visiting aisles in the supermarket I had never been down before. But the selection was so limited – you have to go to the really big shops to get some of the more “unusual” ingredients and a lot of the stock is Clearspring products, which is great, but can be pricey. It’s usually found under a section called “world foods”. A lot of the macrobiotic way is based on the Japanese diet, and despite there being Yo Sushi, Itsu and Wasabi restaurants across the UK, the ingredients have not made it to the mainstream. It seems we love to eat this food but we are all too lazy to cook it. It does take some effort. I was fortunate, with a job in central London, to be close enough to visit the Japan Centre regularly. What a place to explore and find all the staples for macrobiotic meals. All types of Miso, short grain brown rice, shoyu sauce, soy sauce, Umeboshi plum sauce, daikon, ginger, hard, soft, firm, tofu, seaweed salad, fresh and dried shiitake mushrooms, bancha tea – and so on. And the prices are fair (miso sachets, which are great if you are on the road, are around 2 UK pounds for 12 sachets instead of the 4 UK pounds for 4 sachets in the major supermarkets). After a few months of browsing, collecting and experimenting my stock cupboard at home looked like a mini Japanese supermarket. All the refined sugars were out. Beans, pulses and grains were in. My fiance was fascinated by all this and a keen guinea pig. We both balked at my shiitake tea (even with the promise that it helps to eliminate fat from your body), but he loved my brown rice, shoyu sauce, salmon and adzuki beans cooked with seaweed (apparently cooking the beans with strips of Kombu can help prevent wind, which helps when trying to build up friendships on a commuter train). When we had to move to Paris it broke my heart to leave most of my collection behind. I gave a lot of it away as I did not want to explain why I had half of the Japan Centre in my bag on the Eurostar, rather than clothes. I’m going back to the UK at the end of this month for my god daughter’s naming ceremony, and will collect a box of my macrobiotic ingredients. Any move is disruptive to routine, and for the first couple of weeks in Paris I have been completely seduced by the food. At the bottom of our street we have a fromagerie, a boucherie and a boulangerie. Parisian’s would say – bien sur! – but back in the UK it’s rare to have such choice, with entire shops dedicated to specific types of food. The other day I walked past a shop entirely dedicated to Pistachio nuts. Not all nuts. Just Pistachio nuts. So if Paris loves food, then surely I am more likely to find my macrobiotic ingredients here, than back in the UK… I can’t wait to start the search. I just have to dodge the cheese.